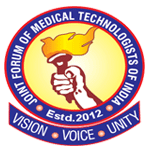 Joint Forum of Medical Technologists of India (JFMTI) is an all India level registered organization of allied health professionals associations. JFMTI (formerly JFMLTS) was formed initially by Medical Laboratory Staff of various Delhi-based Government Hospitals/health institutions in May 2007, for redressal of several long pending policy issues for betterment of Medical Technology and Technologists. Copyright © 2016 Joint Forum of Medical Technologists of India. All Rights Reserved.